1st of May rings a bell; not because it is Workers’ Day, but because it is another time with ELIC [EmmyKokz Live In Concert]! The gospel Afro-beats master, EmmyKokz and a host of other gospel artists will be hitting you like never before in this Third Season of the annual event tagged “WE ARE ONE”! Its last year’s edition was explicitly awesome with the likes of E-Daniels, Timi Toba, Vicky Tee, Chosen Generation Dancers and others who kept the congregants drenched through an unending praise. Nevertheless, ELIC 3 promises to be ‘back-to-back’ in one accord. ELIC 3 is slated for 1st of May at GoodLife Christian Centre, Kubwa in Abuja. Its Red carpet session will be at 3:00 pm and the main event by 4:00 pm. 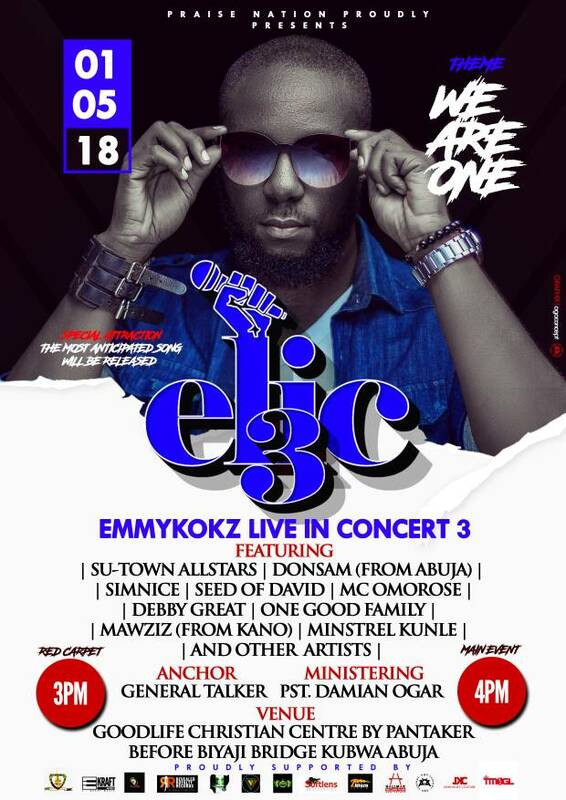 Ministering at ELIC 3 will be Pastor Damian Ogar, Su Town All Starz, Simnyz, Seed of David, Omo Rose, Debby Great, One Good Family, Mawziz, and others. The concert will also mark the official release of his new single titled 'We are one'. Wait for it.